Looking for pizza that's better than the big chains around the Oklahoma City area? Well, you have plenty of fantastic options. Our Great Pizza Search and subsequent explorations have led us to rank the best pizza in the metro. Several metro publications have ranked Hideaway near the top when discussing the best pizza in OKC, and I would love to be different. But I just can't. There is very little not to like about Hideaway Pizza, from the great sauce and spicy meat toppings to the vast variety of pie options. 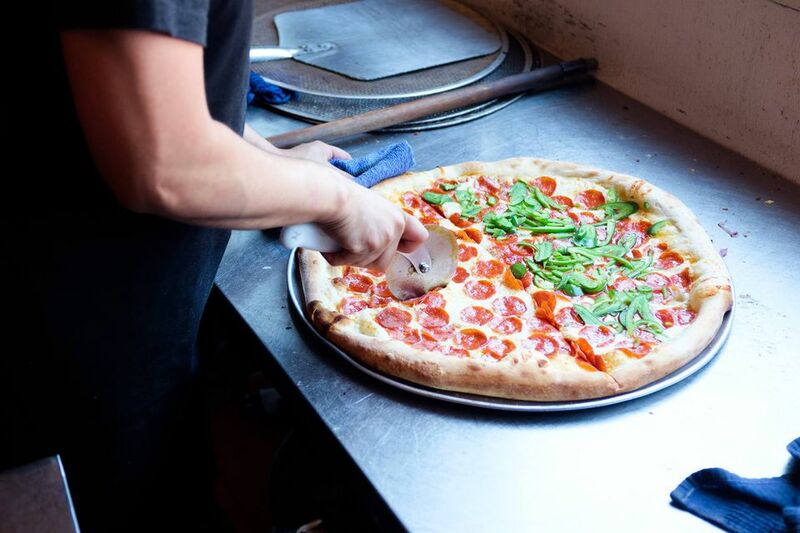 Joining the OKC pizza party in 2014, Pizzeria Gusto offers something you won't find elsewhere: thin, wood-fired "Pizza Napoletana." With a tasty char and fantastic fresh toppings, the pies are complimented be an excellent selection of wines, appetizers and desserts. Visit the renovated building just off NW 23rd for a wonderful dining experience. I didn't try the Wedge on my initial pizza search through the metro, but it absolutely made the first major edit of this list. The restaurant is small and the menu doesn't offer a great deal beyond pizza, salads and a few appetizers. But it doesn't have to. The pizza, made in a wood-fire oven, is fantastic, and there are so many options and varieties. Craft your own pizza from the ground up by choosing the sauce (roasted garlic, marinara, pesto, port wine & sundried tomato), the cheese (mozzarella, parmesan, blue cheese, goat cheese, fontina, asiago) and toppings that even include nuts and fruits. The tasty and intriguing pizza creations are limitless. J-Town Pizza in small town Jones, Oklahoma used to be on this list, but in 2008, the restaurant became a Papa Angelo's. Lucky enough for me, Papa Angelo's is more than qualified to take over J-Town's place on this list. Perhaps you remember the name. The place closed several years ago but has since returned to Bethany. With that classic, thin New York Style, Papa Angelo's also has a unique New York family atmosphere. More than anything, though, they have some fantastic pizza. There's still work to be done, but Uptown OKC is becoming a destination again, and 23rd is the home of several great local dining options such as Pizza 23. With a buttery crust and large meat options, it's a filling but delicious pizza choice. I also like the large patio, the local beer choices and the fresh salads. Located in the hip, revitalized Plaza District of Oklahoma City, Empire Slice House serves some of the best New York style pizza around. Get it by the slice or a whole pie; either way, you're in for a tasty treat. Add a multitude of beer options and a cool atmosphere, and it's easy to see why Empire burst onto the scene as a top metro pizza choice. Jo's is the perfect example of my very reason for taking on the metro pizza search. Located south of Norman, just off I-35 in Purcell, it is a true gem of a pizza place. With the atmosphere of a good old-fashioned, small town pizza parlor, Jo's serves their piping hot, pie crust-encased pizzas on cardboard rounds. It's definitely worth the drive. They recently opened a location in Edmond, but on a couple of visits, I've found that it doesn't quite measure up to the original. I had several Norman-area recommendations, but New York Pizza was one of the first I tried. Located on Campus Corner, it's a college-town favorite. And for good reason. Placed upon an elevated rack on my table, the pizza was a great example of that famous New York style. The sauce is a bit subdued, with a tomato and garlic taste, but the pizza nevertheless stood up as one of the better I tried in the metro. I had been to Bellini's several times, so I was surprised when I received several recommendations for their pizza. I had tried it long ago but never thought of it during my search. So I tried it again. This certainly isn't your typical "call in a pizza" type of place, but with a great thin crust and slightly browned cheese, it's worthy of inclusion here. Located on Memorial Road, Sicilian was recommended to me as being owned and operated by native Italians. I didn't really try to verify that, largely because it doesn't much matter to me. I suppose an Italian can make pizza I don't like just as much as anyone else. But Sicilian Pizza Cafe does it well, Italian ownership or not. With some nice spicy meat toppings, it surpasses most of the bland pizzas out there. Many people I know absolutely love Humble Pie in Edmond (now called The Heat Pizza). I'm not sure I'd go that far. That said, and as I noted earlier, there are so few options for true Chicago-style pizza in the metro area. So if that's your preference, definitely give this place a try. The thick, deep dish pizzas with homemade sauce and buttery crust are very tasty and superior to the restaurant's New York-style offerings, in my opinion.